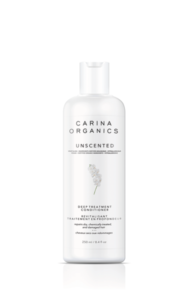 A deep treatment conditioner that helps repair dry, chemically treated, damaged and overworked hair. Restores luster, softness, flexibility and shine. Detangles instantly. Unscented Ingredients: Filtered Aqua, *Cocos nucifera (coconut) oil, **Pinus banksiana (pine) extract, *Matricaria chamomilla (chamomile) flower extract, *Urtica dioca (nettle) leaf extract, *Taraxacum officinale (dandelion) leaf extract, *Trifolium pratense (clover) flower extract, *Acetic Acid (Apple Cider Vinegar), *Olea europaea (olive) fruit oil, *Cucurbita pepo (pumpkin) seed oil. Tip: To prevent damage from pool chlorine, apply and leave in. After swimming simply rinse out.